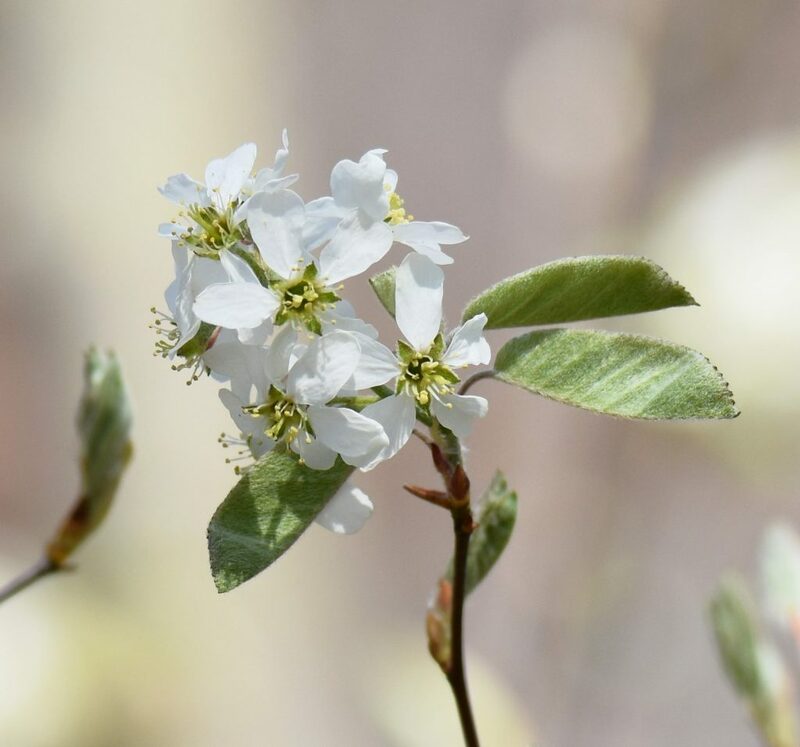 Amelanchier canadensis is a multi-stemmed, erect, shrub with vase-like habit or sometimes a small tree to 8 m; roots associated with vesicular-arbuscular endomycorrhizal fungi (Berliner and Torrey 1989); bark smooth, gray, striped. Leaves alternate, much less than half grown at flowering time, folded, densely white-wooly below, mature leaves hairless, oblong, to 6 x 2.8 cm, tip rounded or with a tiny point, base rounded, margin finely toothed almost to base, 6-11 teeth per cm, sinuses acute, veins 10-15 per side; leaves expand early May; winter plant leafless 153 days (Britton 1874). Flowers white, petals 0.7-1 cm long, oblong to linear, calyx and flower base (hypanthium) wooly-hairy, calyx lobes erect to spreading, top of ovary hairless; monoecious, insect pollinated, flower stalks to 2.2 cm long; flower clusters ascending, to 6 cm long, inflorescence stalks wooly-hairy; blooms May-June (Hough 1983); mid-April (Britton 1874). 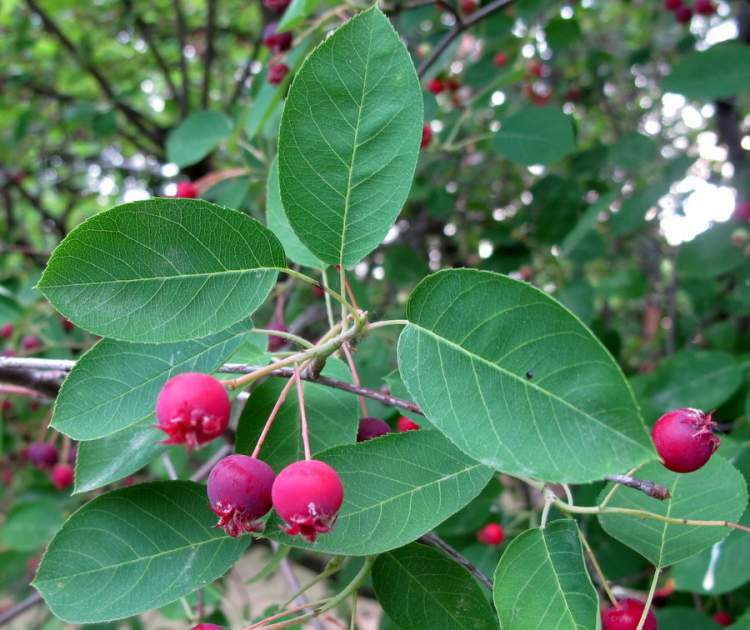 Amelanchier canadensis.Pancrazio Campana.luirig.altervista.org (Accessed 7/2014). Fruit fleshy, red, ripening dark purple, juicy, sweetish; 4-10 small seeds, fruits June-July (Hough 1983). Fruit eaten and seeds dispersed by many birds and small mammals, also by bears, raccoons, coyotes, foxes, skunks (Wilson 1993). Twigs eaten by deer and rabbits. Frequency in NYC: Occasional, more frequent south and east of NYC. Habitat: Moist to dry, undisturbed forests, mostly on coastal plain, shrub swamps, moist, sterile sandy soil of back dune thickets, prefers soil pH 5-6.5. Moderately salt tolerant. Very shade tolerant, index 8-10. Tolerates flooding or saturated soil for up to 25% of growing season (Hightshoe 1988). Intolerant of drought, ozone, sulfur dioxide, soil compaction. Notes: Attacked by many fungi, including brown rot, Monilinia amelanchieris, coral spot Nectria canker, Nectria cinnabarina, and Juniper broom rust, Gymnosporangium nidus-avis, which causes yellow-orange leaf spots with red borders (Sinclair et al. 1987). 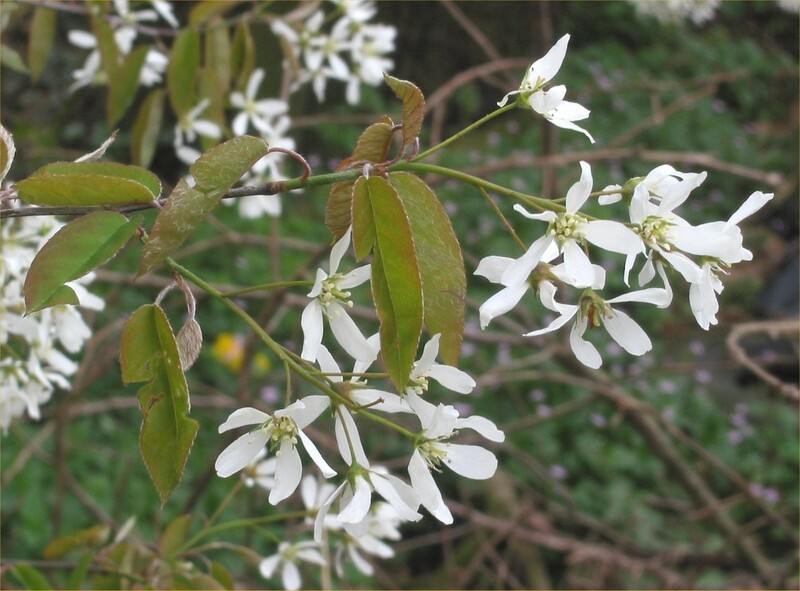 Attacked by the cambium miner Phytobia amelanchieris, a fly as well as other insects (Johnson and Lyon 1991).